I wanted to start speaking about Rafi having had posted so much on Kishore in the last few months. Let us begin with the following song list, the first in a series of many similar to come on Rafi and others. Rafi was the original playback maestro. All others only followed him. While Sehgal fans may not agree with my notion, I can choose to ignore them since they belong to a totally different era. They are hardly any force to make a hue and cry on this issue, anyway 🙂 A list of Mohammad Rafi romantic songs is being displayed here. Remember, I’m no pucca Rafi listener, so bear with whatever I’ve been able to compile for now. My childhood went in listening to an exploding Kishore Kumar. This happened from mid-70s onwards. He was alive till I became 18 in 1987. Rafi passed away when I must have been around 11. Mukesh had already bid adieu a couple of years earlier. I clearly remember them having a sway over my elder generation. I carried a word of appreciation for them by learning from that generation. Rafi’s voice thus became an integral part of my upbringing. Vividh Bharati and All India Radio Urdu Service would air Hindi movie songs in those days. Megaphones in Navaratri and weddings Pandals also used to play them all over the place. There were times, I won’t listen to KK’s numbers for months on (mostly having exhausted myself listening to him). I did not enjoy it, unless I could sing together with the voice I was listening to in those days. And this was not easy to carry out in KK’s case. You could imitate Rafi at any time, on the other hand. His genre carried a simplicity, despite his vastness as a singer, that is not normally observed in any other singer’s style. I used to switch over to Rafi’s camp for this reason, whenever exhausted of imitating KK. 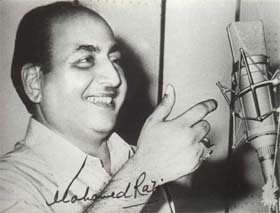 singer , a great soul Rafi. 31st july 1980 -a day when he passed away ,29 years back and leave a heritage of hindi songs for us. His songs are unforgettable and touchy. Whether it is romantic song, sad song, gazal, bhajan,desh bhakti song,classical song or kawali , he tried each shed so effortlessly. His voice association with shammi kapoor was so popular that when he passed away, shammi kapoor said – “today i lost my voice”. Apart from shammi kapoor, he had given playback to all famous actors of past era -rajendra kumar,jitendra, dilip kumar,,joy mukherji ,devanand and gurudutt -his contribution is so wide . Your attempt to put all popular rafi songs in one stop is appreciatable for all his fans. Rajendra kumar- Tum Kamseen ho, nadan ho -Aayee milan ki bela. many songs of Rafi saab are not include,like a songs of saaz aur aawaaz,aakri dao,chhaila babu(LP’s first recording with rafi),haqueeqat,akalmand,yehdil kisko du,robin hood,shikari etc etc.